Recently I was in Singapore, the land of shopping and boy did I do some shopping! They also have a Sephora! When I saw that I thought I had died and gone to heaven, after a month in India I definitely needed some luxury in my life. I somehow ended up spending all of my money in Sephora alone so I thought I would share what I purchased. Now it would be too much to do it all one post (told you I spent a lot) so I’m going to split it up into two parts – eyes and lips and then face products. First up is eyes! As you can see above I couldn’t buy just one palette I had to get two! This is the Stila Eyes Are The Window In Soul and Mind. First up is Soul– This is an absolutely stunning palette! It has a mixture of shimmers and mattes which comes in very handy. Surprisingly I actually don’t have a lot of these colour in other palettes (well I do but there is a slight difference so I still needed to buy it). I feel like this is the perfect all in one that you could take on holidays and need nothing else, the possibilities are endless with this little beauty! The second palette is Mind– this one is all mattes. Now I look at this one and think, I probably could have done without this one but what the hell – when in Rome and all that. 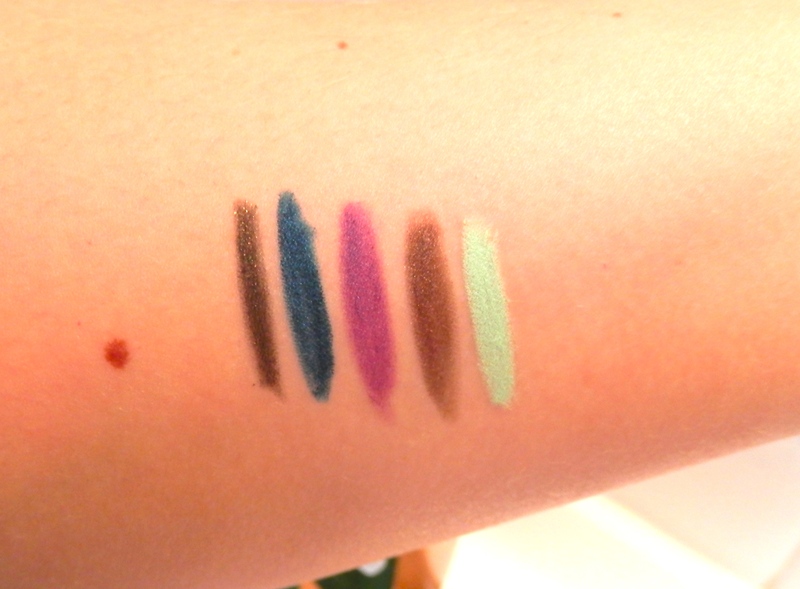 The shadows themselves are super pigmented and extremely easy to blend which isn’t always the case with mattes. It has got a great mixture of warm and cool tones which is perfect, it is also perfect for a more subtle day time look or mixed with the shimmer palette for a nice shimmery look. 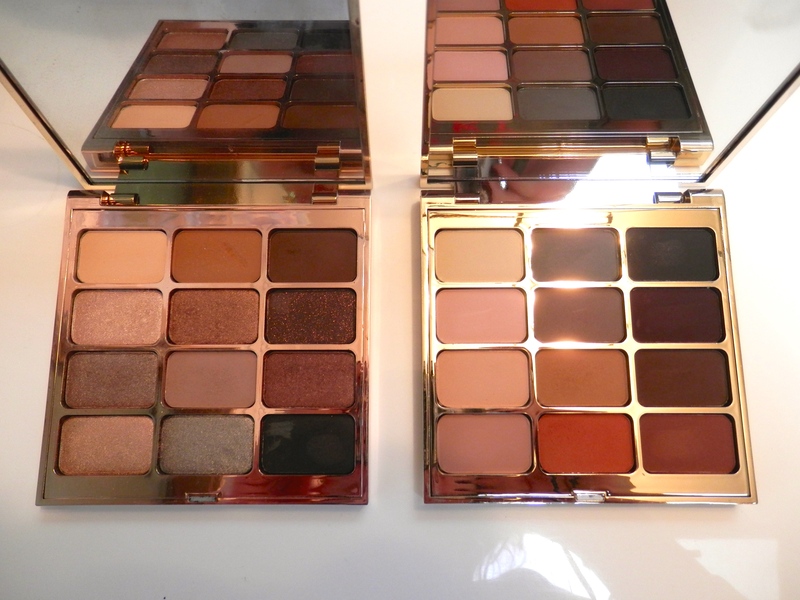 All in all I’m in love with these palettes! To continue with the eyes I couldn’t go past the hype of the new Benefit Roller Lash-this is a really lovely mascara it definitely keeps the curl in my lashes and lengthens them to no end! It doesn’t separate my lashes as much as my beloved clump crusher but it only needs one coat and you’re good to go. I also love that this one can be removed a hell of a lot easier than the they’re real mascara! Next up I went a little crazy on eyeliners! I don’t really stray much from black or brown liners so this time I thought I would branch out and get some colour into my life. First up is the Sephora Waterproof Contour Eye Pencil 12HR Wear in Diving Malaysia – this is a beautiful olive colour with gold shimmer running through it. This is a subtle way to add some colour into your makeup, it isn’t terribly noticeable but just adds a little somethin’ somethin’ to your look. 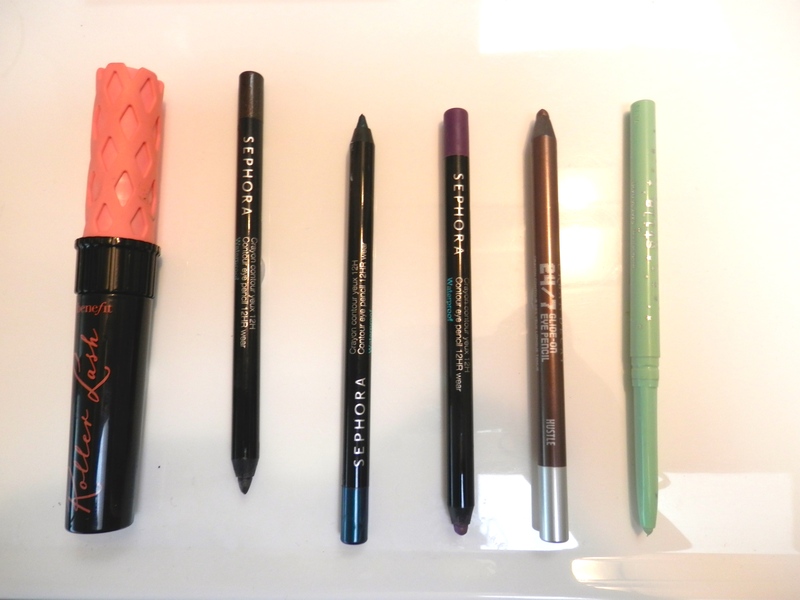 Second is another Sephora 12HR Eye Pencil in Surfer Babe-now this one is is a bit more colourful, a bright turquoise that can be used subtly on the top or bottom lashes to up the ante. I actually wore this to a festival a little while ago and it just added a little bit of fun to my look. Third is the Sephora 12HR Eye Pencil in Purple Stilettos- This is a lovely lilac purple which I have used a fair bit in the summer. I normally line the top lash line which doesn’t look too crazy, it also makes my eyes look especially green! The sephora eye pencils are great! They are super creamy and don’t drag at all. Plus they are waterproof so they do a good job of lasting all day! Next up is the Urban Decay 24/7 Glide on Pencil in Hustle- A great bronze colour that is waterproof, something I don’t actually own. I get a fair bit of use out of this when I don’t want to use a black liner. Finally is the Stila Smudge Stick Waterproof Eyeliner in Mint Julep- this one was an impulse buy for sure! I went to use this during the summer and was a little disappointed. My plan was to just draw a simple line on my top lash line without any other eyeshadow etc however, it was very patchy, I was expecting an opaque line what would look really striking. Even when I tried to build it up it kept rubbing away in other spots. Not happy with that purchase. 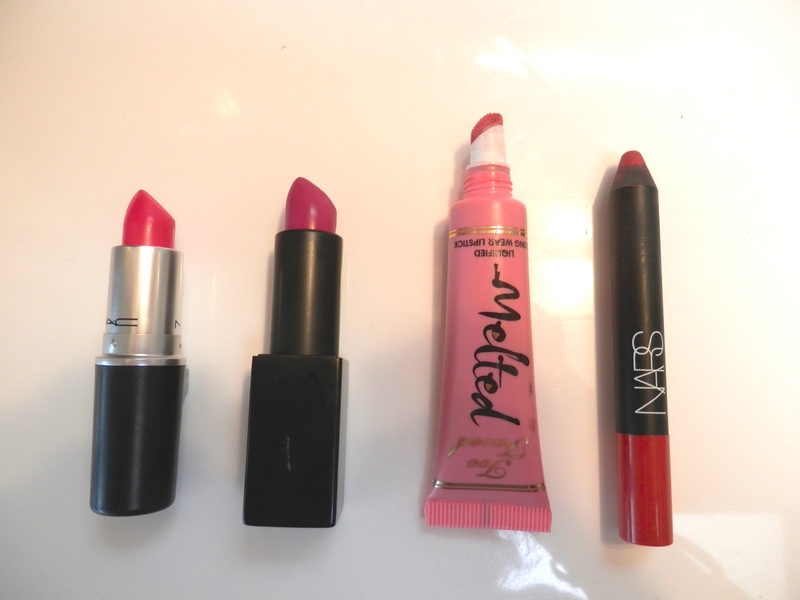 Now to my absolute favourites – lipsticks! I feel that I was quite conservative with the amount of lipsticks I purchased, four is nothing compared to what I am capable of. First up is MAC Matte in Pink Pigeon – This is a super hot pink colour, very opaque and very striking on the lip. I actually wore this when I got off the plane to fake the look of freshness even though I felt like rubbish! I hadn’t tried any of the new Nars lipsticks so as soon as I saw a Nars counter I jumped on them. I came out with the Nars Audacious in Angela – This is what I would describe as an orchid purple, now will you believe me if I say I don’t own a colour like this? Probably not but I bought it anyway. These lipsticks are beautifully creamy and opaque which is what I want in a colour like this. I have gotten a fair bit of use out of this one so far! Next up is the Too Faced Melted Longwear Lipstick in Melted Peony – This is just a lovely everyday pink that will go with any look so this was definitely a great purchase, I often wear this if I’ve done a dramatic eye and just want something simple on my lips. Finally is my absolute favourite Nars Velvet Matte Lip Pencil in Dolce Vita – I have quite a few of these lip pencils and a while post dedicated to them (click here if you would like to read it). I had never even given Dolce Vita a second look however, when I swatched it I thought it would be perfect for everyday wear, a very subtle dusty rose. I actually pair this with MAC lip pencil in whirl to get the ‘Kylie Jenner’ look. This is an absolute staple in my handbag at the moment. So there it is, part one of my Singapore haul. On Friday I will post what face products I purchased including quite a few foundations. To be honest I went foundation crazy over there! What is first on your list when you visit Sephora? I’m always up for suggestions especially now that Sydney has a Sephora. Hooray that you now have a sephora in your backyard! I’m obsessed with all of the ysl lip products and think you can’t go wrong with any of the rouge volupte colors! I love #9 (kind of like a more pink dolce vita you mention) and #11 for a super fun pop of color!